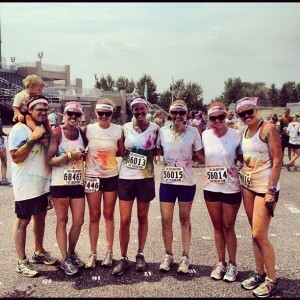 This weekend my sisters, Seth and I met some of Traci’s friends up in Minneapolis to do the Color Run! 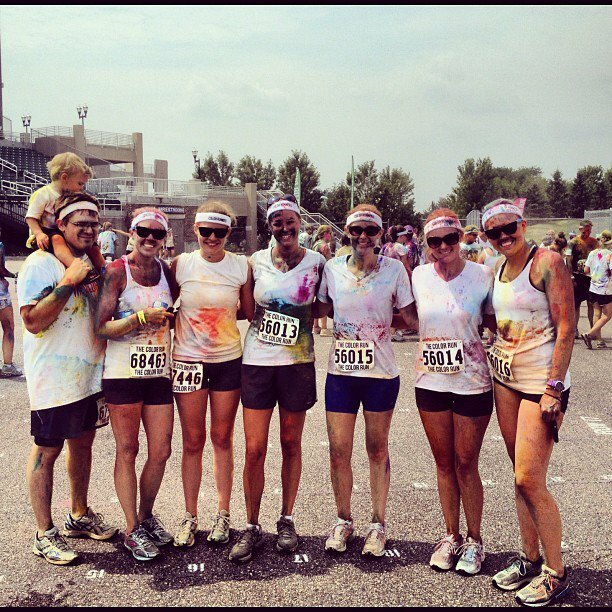 We had such a blast! Seth and Andrea decided that they would walk with Tayden so Traci and I could run as we kind of wanted to use this run as a mini workout to get us ready for our half marathon next weekend! 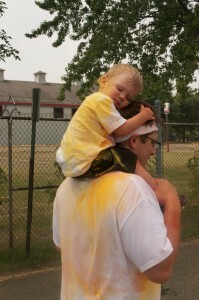 Tayden ended up spending lots of time on Seth’s shoulders as 3.2 miles does get tiring! Andrea and Seth were such good sports to take him with and walk with him since we didn’t initially plan on taking him on the run and I didn’t bring a stroller to push him in! 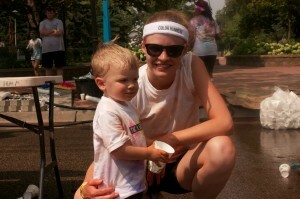 After the color run we went to get some lunch and then headed back to the hotel to play in the water park! 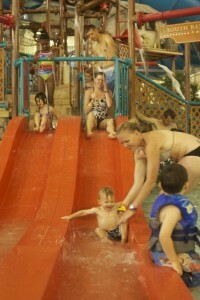 We stayed at the Radisson in Bloomington so we got to enjoy the “Water Park of America” and it was soooo much fun! Tayden is starting to become so much more brave in the water. 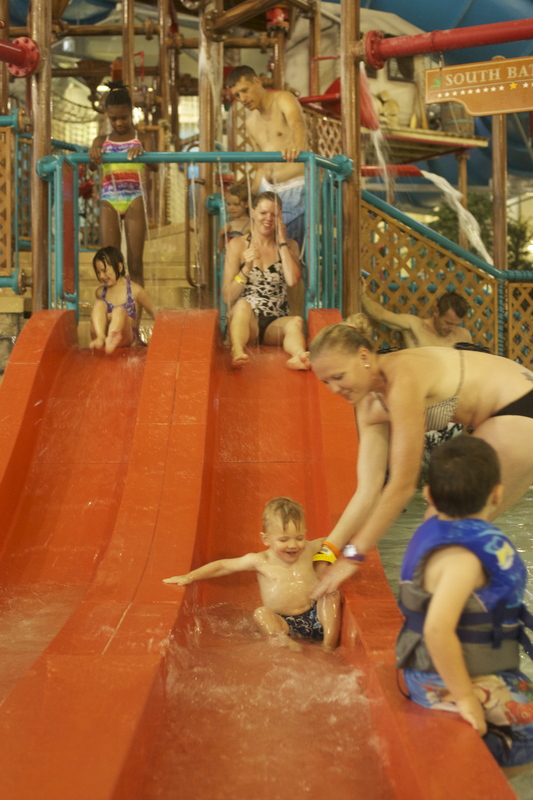 He went down a few slides and we even did the family tube slide which is a big huge tube that we all sat in and went down! I think that one actually scared him though! 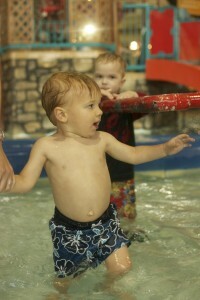 His favorite was sitting on our laps (which I don’t think was really allowed) and going down the body slides! And he of course loved the little kid’s slide and become so comfortable with it that he was going down feet first on his tummy!!! We didn’t get many pics at the water park since we used up most of our camera batteries at the color run!! 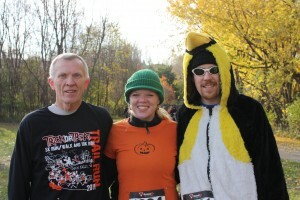 Trick or Treat Trail Run! 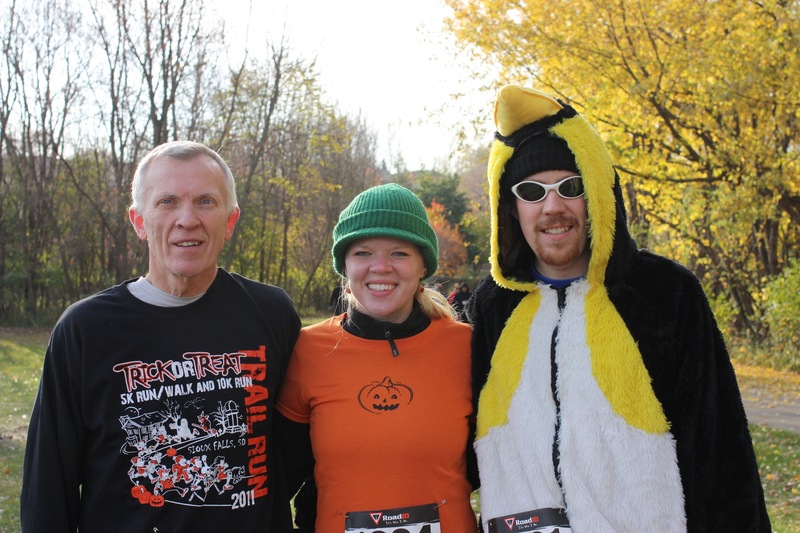 Today we did the Trick or Treat Trail run and it was a blast! 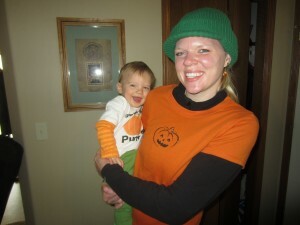 We felt a bit crazy doing it as it was SUPER cold, but with our fun costumes (ehem … Dan) we kept warm! It was too cold to bring Tayden so he stayed back with Grandma Barb and Aunt Andrea to help make us runners some breakfast! Do I sense a new Tradition??? This weekend My Dad, Dan Overby, and Myself ran the Miracle Network 5K. 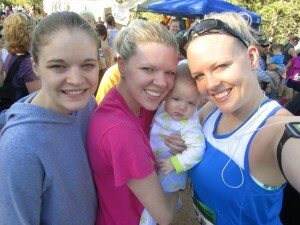 Traci ran the half marathon and Andrea and Seth came to cheer us on! 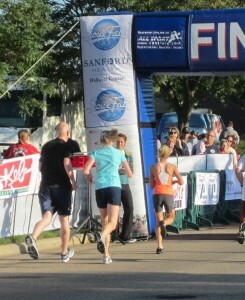 Considering I hadn’t really run since we did the Marathon Relay in Deadwood and my dad has been running 3-4x per week, I felt ok with the fact that he finished a whole 30 seconds ahead of me! haha!! I think Dan was just being nice and hanging back with me. He probably could have finished sooner as well. We had so much fun that we’ve talked about possibly running the Halloween Trick-or-Treat run! But Dan will have to help us make our costumes! 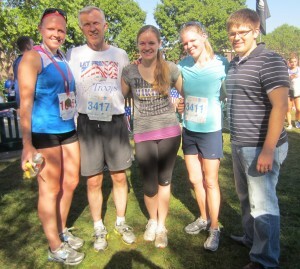 Traci ran the half marathon while Kristine Dineen, Myself, Dan Overby, Andrea, and my Dad ran the Marathon Relay. 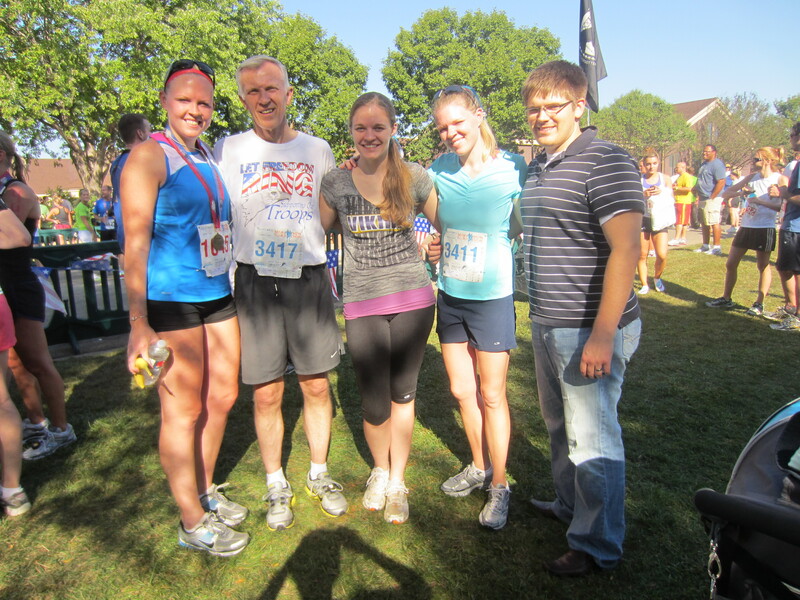 Aside from Mr. Bobby Dineen, Seth, and Dan dropping Kristine off at the WRONG starting point, the race went great! 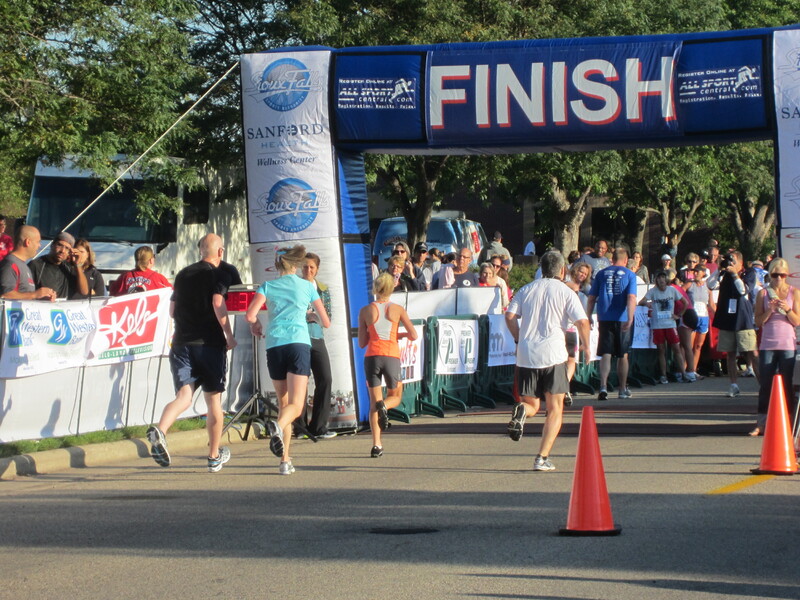 Here is a picture of the finishers! 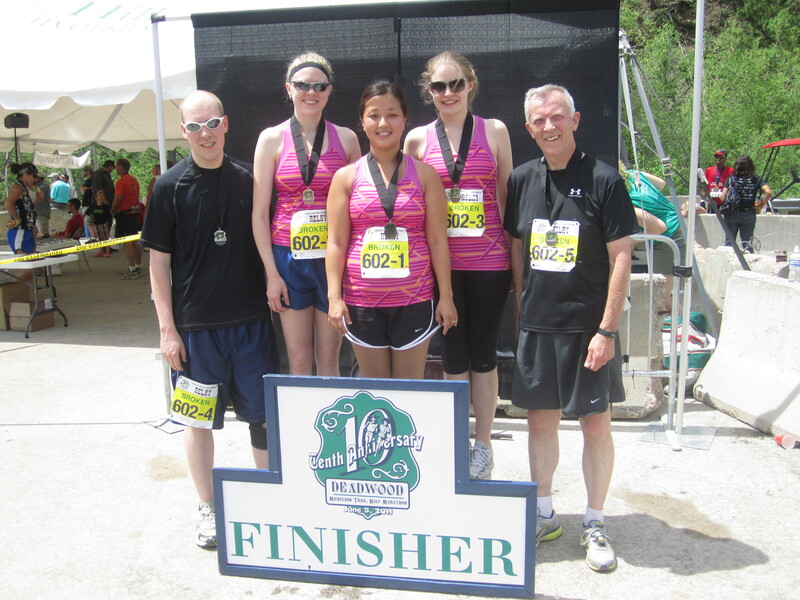 I think most of us were very happy with the way we ran. 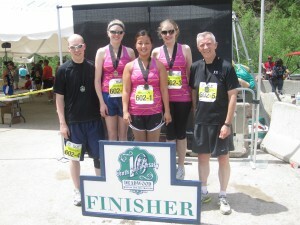 I was probably the only one who was dissatisfied with my run. I guess having a baby, crappy weather, and not training as much as needed didn’t help an uphill and very warm run. Oh well! It was fun nonetheless!! After we all healed from our runs, we had a great dinner. 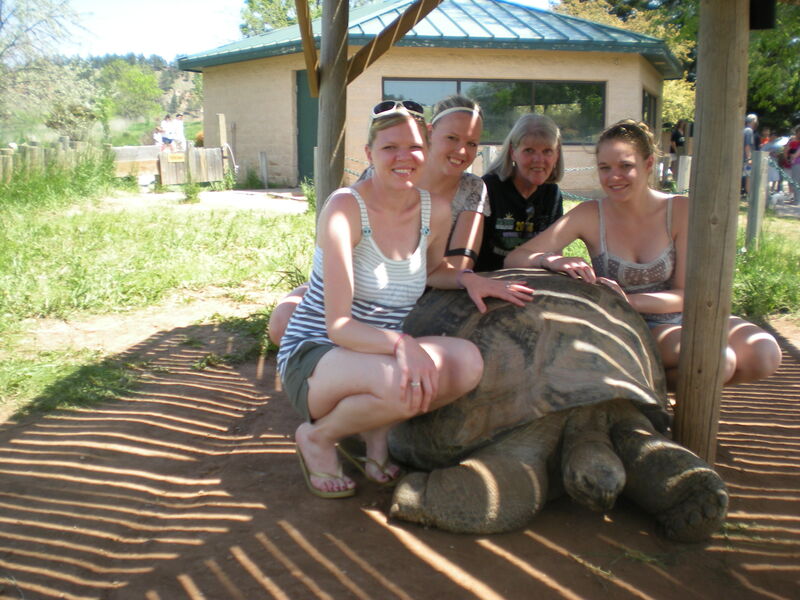 Then the next day we stopped at Reptile Gardens! That was fun. 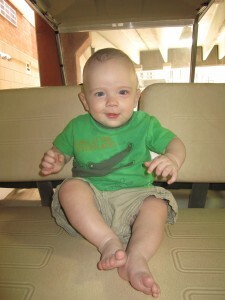 As you can see Tayden was prepared with his Alligator top. 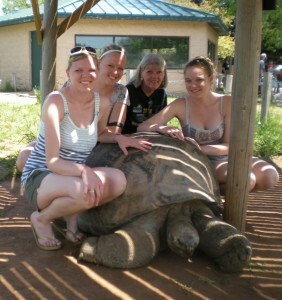 We were able to meet Methuselah, the oldest turtle there. She will be 130 in a few days! Oh yeah! And it was Seth and my 2nd Anniversary too! We didn’t get any pictures together though. Oops! 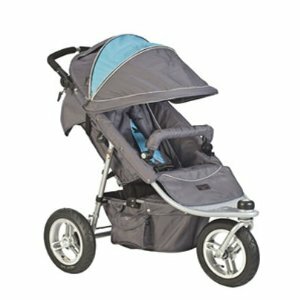 Well, we’ve officially decided upon a stroller! We got a pretty good deal on it online so we ordered it and I am now waiting for it to arrive! I think it will be here tomorrow. But of course it’s going to rain tomorrow, so trying it out will probably have to wait. BUMMER! 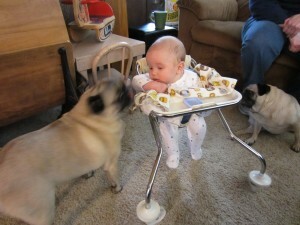 I’m super excited to try the new stroller out soon though! We stayed with our friends Laura and Lorraine Schmidt when we went to Marshall for Suzie and Chris’ wedding so Tayden got to try out all of the fun toys that Lorraine has for her Grandkids. The doggies were super curious of the new creature that was visiting their house! 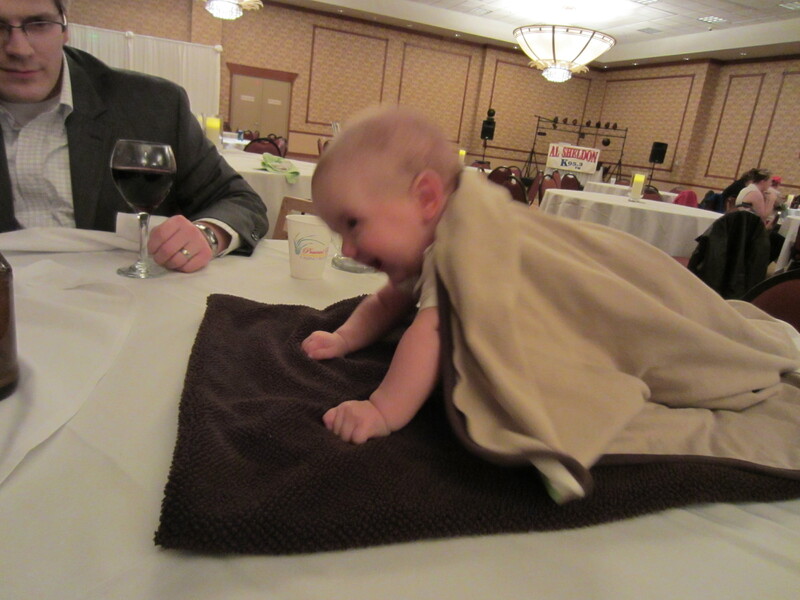 And finally, I didn’t get very many pictures at the wedding, but one cute one I did get was of us trying to decide whether or not Tayden would appreciate a nap during the reception. He chose to socialize instead of nap! Needless to say, he slept well that night! All in all, it was a great weekend and we had a blast visiting our Marshall friends and sharing Suzie and Chris’ special day with them! So this weekend was full of great fun, great people and great food! On Friday night we (Me, Seth, Wes and Laura) decided to celebrate Seth’s birthday (as well as our friend Wes’s birthday which was a couple of weeks ago) by going to a movie and follow it with bowling. I thought Alice in Wonderland was pretty good! There wasn’t too much of a plot but I’m not going to lie, I had a really good time seeing all the clothes as I thought the costume director did Such a good job with them! Bowling was a blast! We got the Beer Vessel filled with, well… Beer and bowled a couple of games. It was this giant thing that had a spigot on it to pour the beer out of. I’m not quite sure how many glasses we got out of it, but it definitely left a few of us “unsober” when we left! Seth won both games of bowling! We let him though. What kind of friends would we be if we didn’t let the birthday boy win?!? Saturday was great because my mom came to visit and we made a wonderful Chicken Cacciatore subway sandwich for dinner and followed it up with the annual BEATS concert. My fellow coworker works with the percussionists in the school system to create this concert. There is so much creativity and talent crammed in to 1+ hour of entertainment. It makes me feel happy to know that there are still kids out there that still desire to learn and do a good job! THEN, this morning my mom and I made some great bread pudding to eat with our brunch. It was a great way to end this weekend. I shall now relax some before dinner and rest my legs from my 4mile run that I just completed! So this weekend Seth and I headed to Mount Kato to go skiing and it was a blast! Not quite the same as skiing in Colorado but for a place only 2 hrs from where we live, it’ll have to do! Right about the time we were debating calling it quits it started to rain and the slopes started to get pretty slippery so it made it easier for us to decide to leave! We then headed for the mall where we had to do a couple of returns. Not gonna lie, Victoria’s Secret is kind of starting to tick me off when it comes to doing returns there. They make it very difficult to actually return something. That being said, I now have a piece of lingerie that does not fit me. I think I shall boycott VS for a while. Any suggestions on where to go other than there girls?? Another piece of fun (at least to me) news is that I got a new pair of running shoes! Seth and I both decided to try our luck with Mizunos. My first run was interesting as my feet started to burn probably due to over-heating or something so I hope to gradually wear them in. My half-marathon training is going pretty well. My knees still aren’t bothering me, so that’s great! Alright, that’s all I’ve got for now! 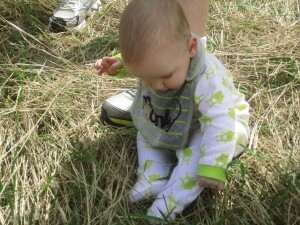 So, I figured I’d post a little something as it’s been quite some time since I’ve blogged! 2.) We can only shovel the snow to so many places! Out little doggy path is getting skinnier and skinnier with the tops of the drifts getting higher and higher around it! 4.) I like sun and am done with the snow. Bring on the flowers! That being said, we are officially training for the half marathon on Mickelson Trail in Deadwood, SD. It’s over our Anniversary weekend, so that should be fun! Probably not the way Seth prefers to spend our Anniversary weekend, but we’ll have fun! Training for me is going ok. I went to the chiropractor to check out my knees last week and he said I have patellar tendinitis. It’s something that can be healed by rest. Since that really isn’t an option as I WANT to run this half marathon, he has encouraged me to do lots of icing and stretching. It was the first time I went to a chiro so that was interesting. One of my legs was like half an inch longer than the other so he was able to rotate my pelvis and stretch the tendons and it was miraculously better! :/ He did some cracking of a few joints (the neck was the coolest) but basically helped me out with my knees. I don’t see myself going at all on a regular basis, I just wanted help with my knees and to know what was wrong with them and how to help it! Alrighty, On that note, I must end this blog as it has become much to long! Well, It’s back to school for me! Even though it really felt like I didn’t have much of a summer since I was so busy with so many crazy things! 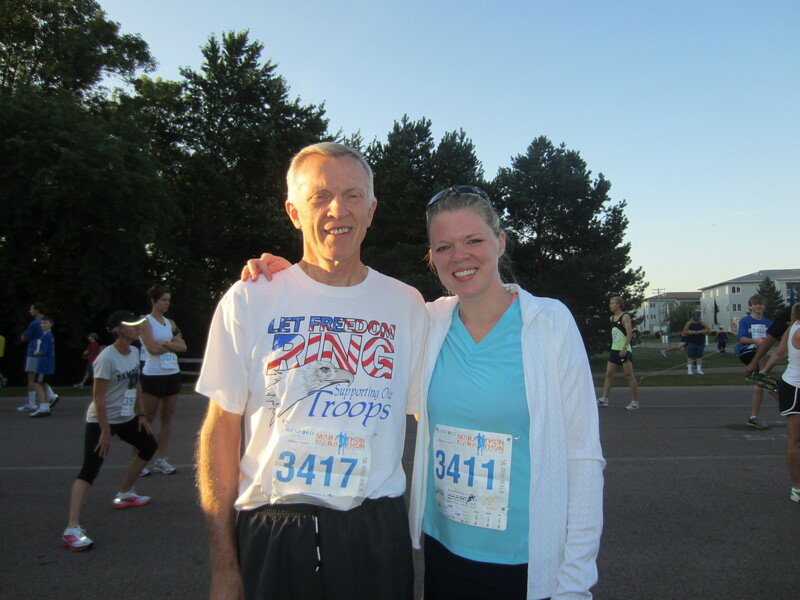 I’ve also been training for a ‘virtual’ 10k to get ready for a half marathon next spring. My last 2 runs have been rough as I’ve been having some pain in my kneee. So yesterday’s run got cut short from 6 miles to a little under 3! So Sonja and Traci, take advantage of that! Unfortunately for Seth, unless he continues to run after I’m done or goes out on separte runs, his will be the same as mine! Next up on my plate for today is the Sounds Of Summer Parade at 3. We have both the middle school kids and the high school kids marching. (Band that is). If the weather is cooperative, it should be a nice day for a parade! The MS kids are super excited. Pretty sure the HS kids would rather be out doing something different as this is lame to them compared to competitive field marching! Following the parade we are headed to Spirit Lake to celebrate Traci’s birthday! She turns the big 22 and the plans are to go out for a drink or two tonight and then have a nice lunch tomorrow! Should be a good time! We’re (well at least I am) pretty excited about our gift to her so I hope she likes it as much as I do!!! Well I suppose I should go clean the house a bit before I head off to my next activity!